This Beautyrest Premium Cotton Top Mattress Protector can extend mattress life. This bedding accessory has a comfortable soft top cloth that provides exceptional durability and comfort. Conveniently machine-wash the pad when needed for easy care. The Expand-A-Grip® construction holds the pad firmly to mattress. The Beautyrest Premium Cotton Top Mattress Protector - Full Size has many exciting features for users of all types. 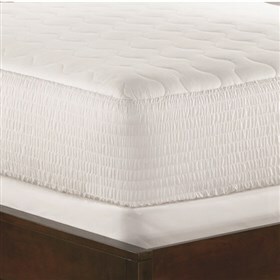 The Beautyrest Premium Cotton Top Mattress Protector - Full Size is sold as a Brand New Unopened Item.